Here at Aspire Pilates The Hague we are passionate about empowering people to become strong, confident and balanced in body, mind and spirit. We would like to share our passion with you. 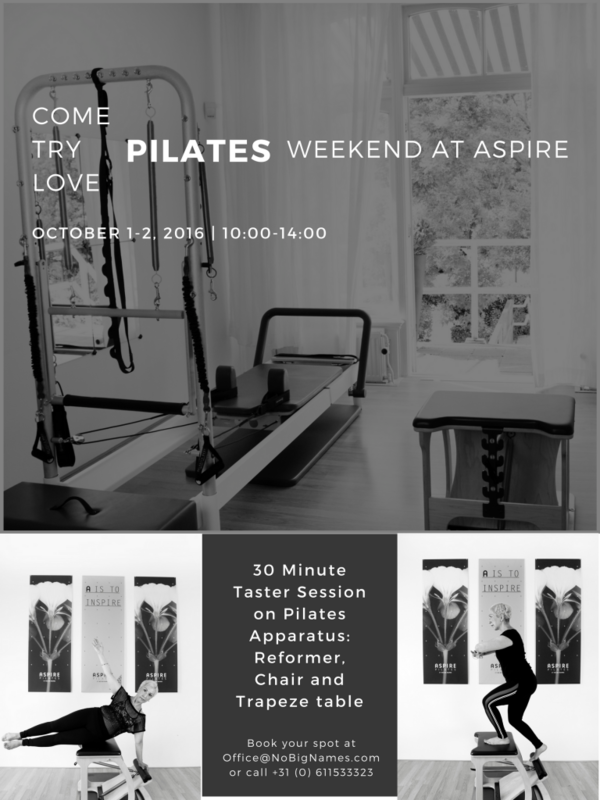 We are organising a special COME TRY LOVE Pilates week-end on October 1-2, 2016 at our studio located at the Bloom House of Health in Koninginnengracht 28. The studio will offer free 30 min taster sessions on Pilates apparatus: Reformer, Chair and Trapeze table. These will be suitable to all ages and levels of ability: fit, unfit or couch potatoes — everybody and every body will benefit. All are welcome to stop by the studio for a taster session, or a peek at what we do, consultations, demonstrations, special offers. Registration is required for your free taster sessions and can be completed by sending us an email at office@nobignames.com. Please indicate your choice of equipment piece. We welcome everybody and every body to our special week-end. We are delighted to introduce you to Pilates and help you discover how this method created by Joseph Pilates 100 years ago can transform your life, no matter what you are seeking. You want to tone? Do Pilates. You want to rehabilitate? Do Pilates. You want to enhance your sport performance? Do Pilates. You are pregnant? Do Pilates. You need to de-stress? Do Pilates. You need a holistic approach to your body? Do Pilates. You want variety? Do Pilates apparatus. You want less aches and pains? Do Pilates. You want to gain confidence? Do Pilates. We look forward to welcoming you at the studio! Email Office@NoBigNames.com reserve your FREE session.